Growing up in a predominantly Jewish community often meant my friends would bring Jewish treats to school to share. I sampled macaroons, matzoh, mandel bread and the cutest triangle shaped pastries--Hamantaschen. It's been maybe one or two decades since I had hamantaschen (I had a Jewish boyfriend about a decade ago and can't remember if his grandma sent him mandel bread and hamantaschen but he did share some baked goods with me). 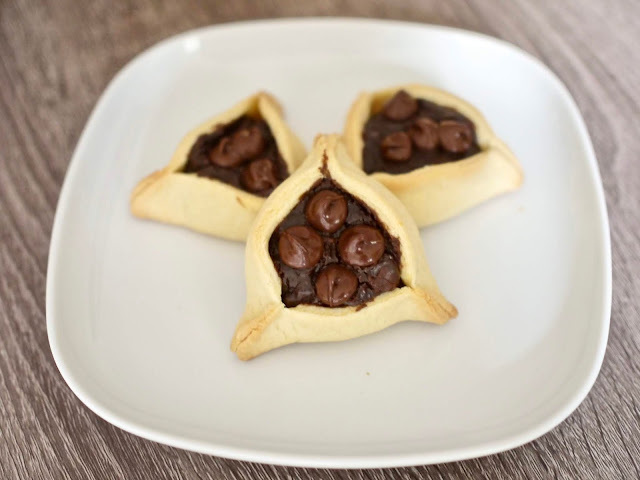 Hamantaschen are triangle shaped filled pastry that are eaten during the holiday Purim and are traditionally filled with poppy seed. 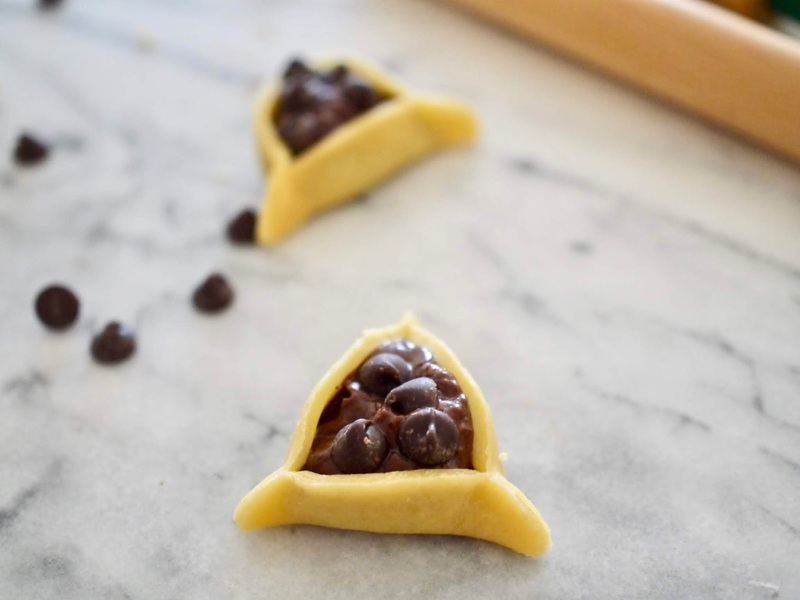 After spotting this chocolate chip hamantaschen recipe from the NY Times, I thought it was the perfect hybrid of my most recent chocolate chip cookie binge with these festive treats. After reading the recipe reviews, many people recommended finding another dough for the filling so I then found this recipe from Leah Koenig on Food52 (at the recommendation of Molly Yeh) and then filled them with pastry cream and topped with chocolate chips. 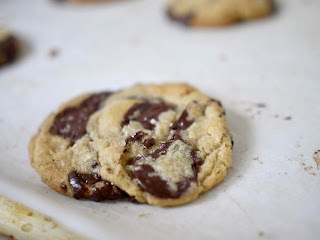 It took some time to realize that the dough is better when it is rolled out pretty thin to make a less doughy cookie and then the filling can really shine. Totally. Delicious. 1. Assemble dough and refrigerate for three hours and while waiting, assemble filling. Whisk egg yolks, sugar, cornstarch and cocoa powder in a medium bowl until smooth. 2. Heat milk and vanilla bean in a saucepan until it simmers over medium heat. Remove from heat and remove the vanilla bean. Split the bean and scrape the insides into the milk. 3. Pour 1/3 of milk into egg mixture and whisk. Then pour back into the pan. Over low heat, whisk continuously until mixture bubbles and becomes a thick pudding-like consistency. 4. Remove from heat and stir in chopped bittersweet chocolate until melted and smooth. Pour into a bowl and cover directly with plastic wrap. Refrigerate for 1/2 hour. 5. After cooled, remove chocolate cream from refrigerator and mix in chocolate chips. Preheat oven to 350 degrees and line baking sheets with parchment paper. 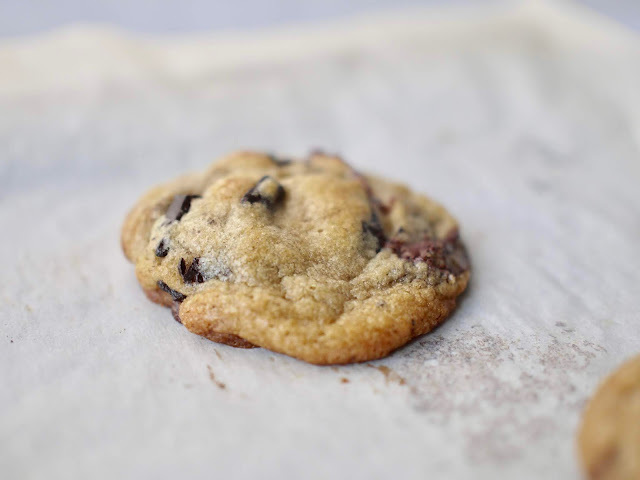 Remove dough from refrigerator and let it sit out for 5 minutes to become pliable to roll out. 6. Roll out dough onto a lightly floured surface to 1/16 of an inch thickness. Using a 3 inch circle cookie cutter or wine glass, cut circles into dough and place onto parchment lined baking sheets an inch apart. 7. Fill each dough circle with a teaspoon of filling in the center. Fold over dough sides to form a triangle and pinch sides closed. 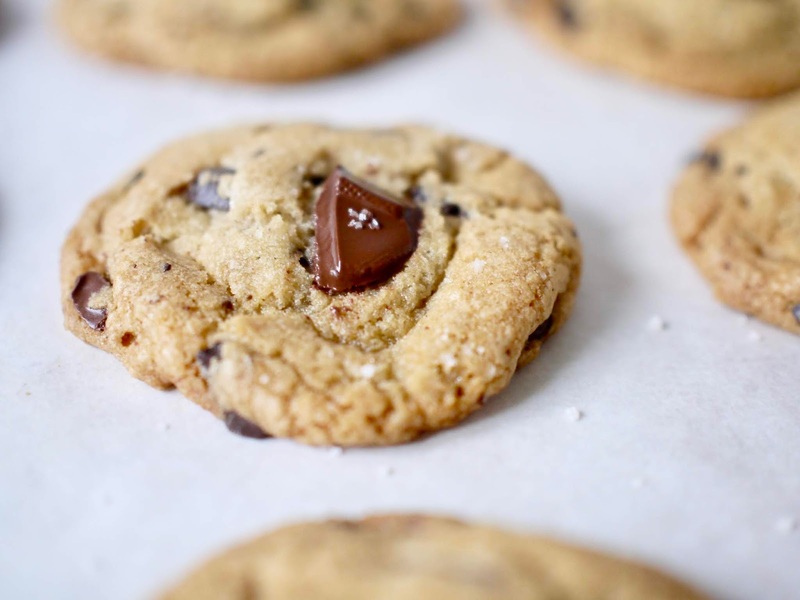 Then top each with chocolate chips. Bake at 350 for 15-18 minutes until golden brown. 8. Let cool on baking rack for 5 minutes and then enjoy! 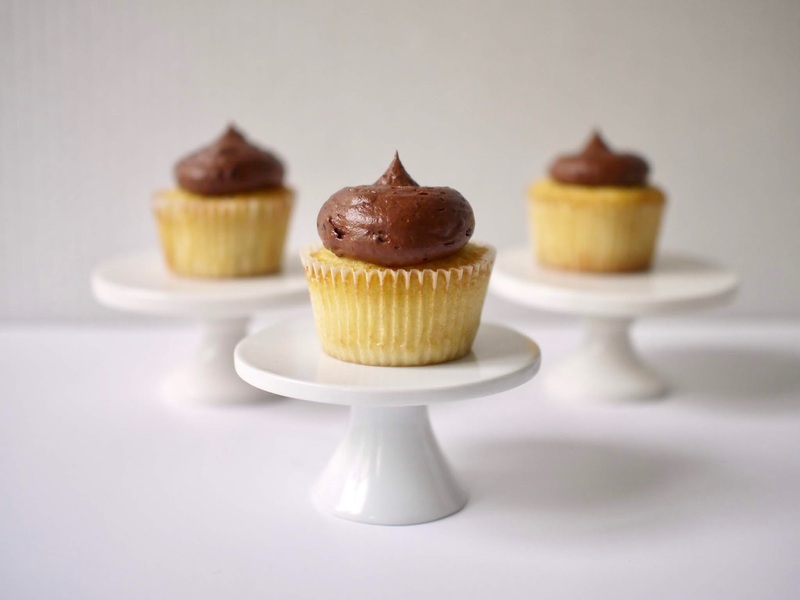 In the midst of chocolate chip cookie madness, I took a couple cupcake breaks--I baked cupcakes and patronized a suburban bakery to pick up a birthday cupcake for a friend (and of course one for myself). To be honest, it's been exactly three years since I last baked cupcakes. But the welcome back to it was wonderful---all thanks to King Arthur Flour's Recipe of the Year. 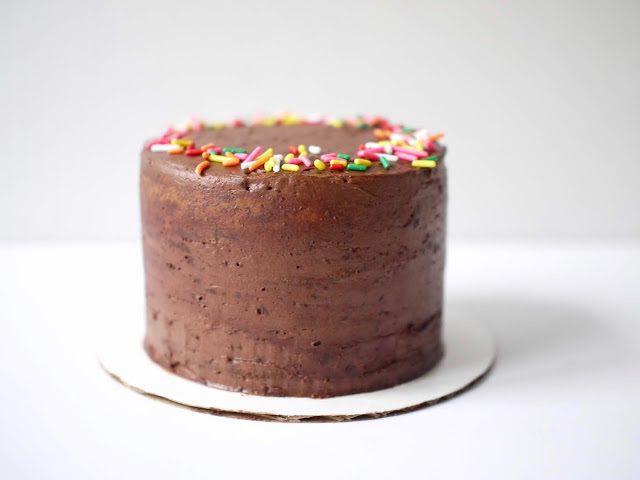 Classic birthday cake with a simple chocolate frosting is all you need sometimes. I have had a disastrous track record with baking my own birthday cakes the past few years and I may just have to make this yellow cake tradition now. It was simply just really damn good cake: fluffy, moist, light and not too sweet. And it was the perfect mini cake and cupcakes for a friend's birthday a month ago. The Recipe: King Arthur Flour's Classic Birthday Cake. The recipe says to bake them as cupcakes for 25-28 minutes but luckily I just kept an eye on mine and they were done in 17 minutes. Also I used less powdered sugar in my frosting, which created an almost whipped texture (and not too sweet frosting). For another friend's birthday a couple weeks ago, I happened to be running errands in the burbs on the Kansas side of KC and popped into a local bakery I've had on my radar for a while. 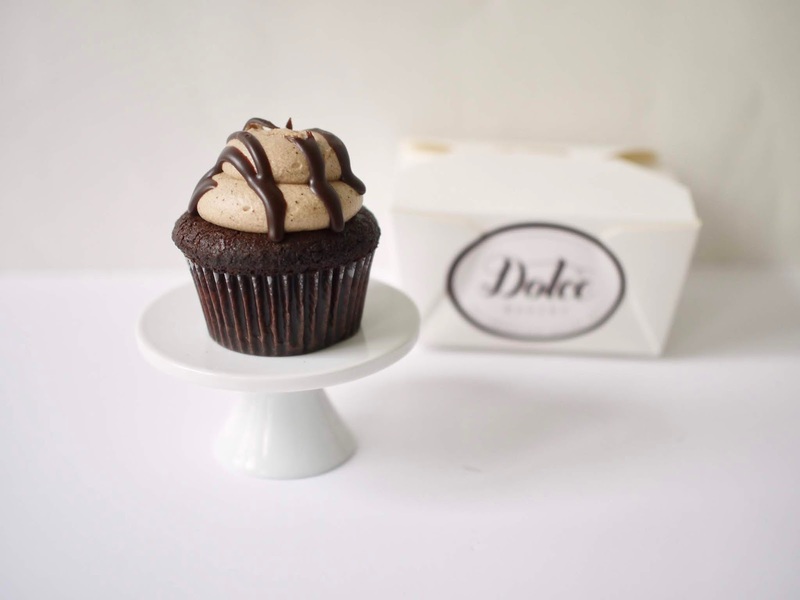 Dolce Bakery offers standard size as well as mini cupcakes and offered four flavors that day. My standard cupcake was $2.75. I opted for their seasonal Chocolate Guiness cupcake with chocolate espresso frosting and got a festive chocolate sprinkle cupcake for the birthday girl. I let my cupcake come to room temperature (it was a little chilled upon purchasing it) since it felt a little dense. But the texture at room temperature was moist and the cake was topped with a flavorful light and fluffy frosting. It was a delightful little treat that was packed with great flavor yet it wasn't too sweet. After baking seven chocolate chip cookie recipes, I decided to take a little break from my cookie quest and throw a cookie taste testing party. 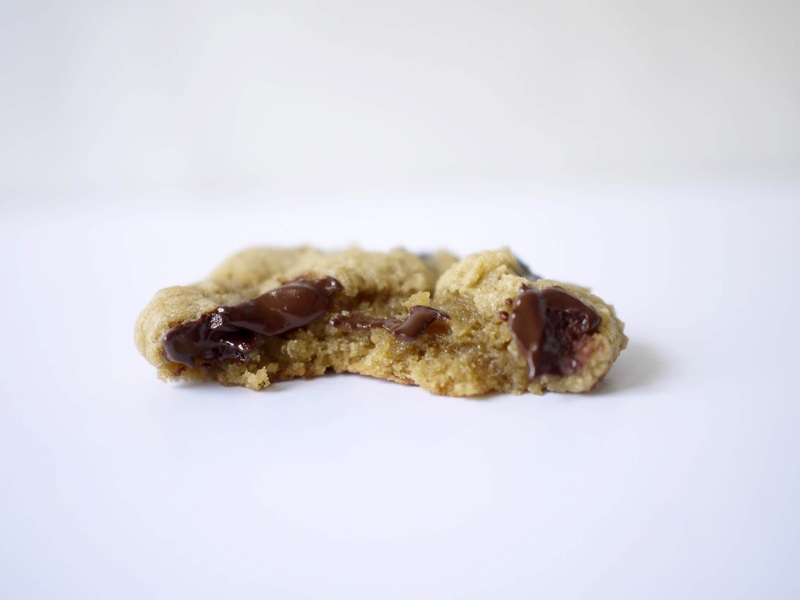 (I had saved several cookie dough balls of each cookie in my freezer for this momentous occasion). 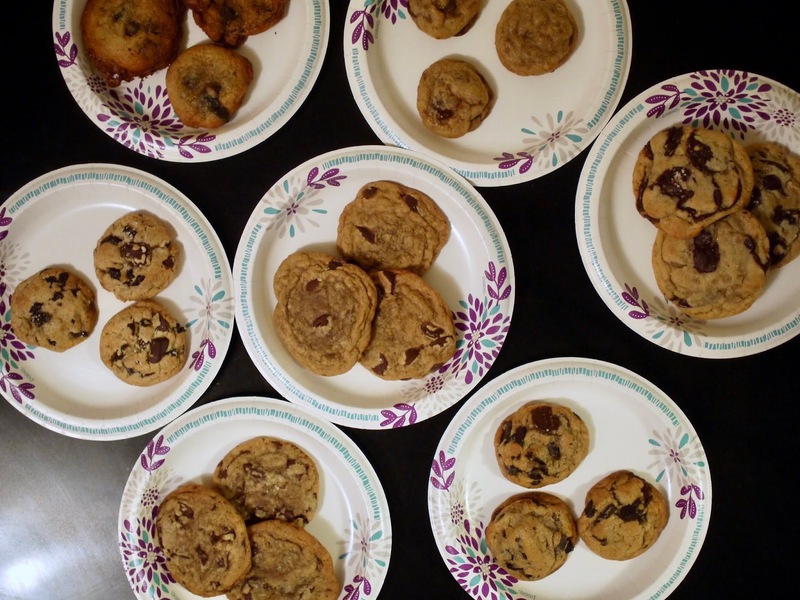 Interestingly enough, my friends and I thought it was a little difficult to rank the cookies since they all were delicious. 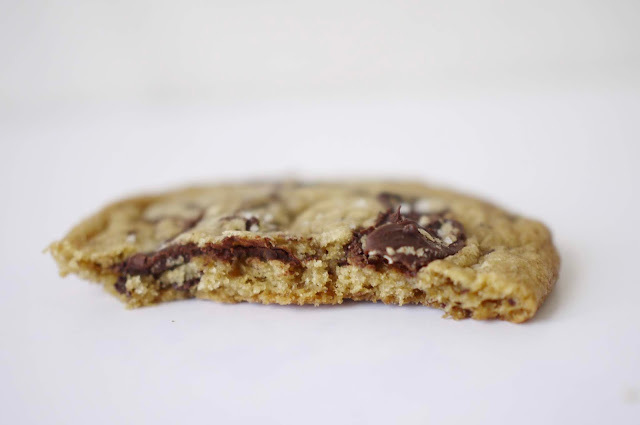 I was surprised that my least favorite cookie from my initial ranking topped a third of our lists (the NY Times recipe) and that my favorite cookie also changed to America's Test Kitchen's. chopped chocolate yields a prettier cookie since the little bits of chocolate are dispersed throughout the dough. The Jacque Torres cookies looked like my ideal of a gourmet bakery cookie with its ripples and large melted chocolate mounds throughout the surface of the cookie. 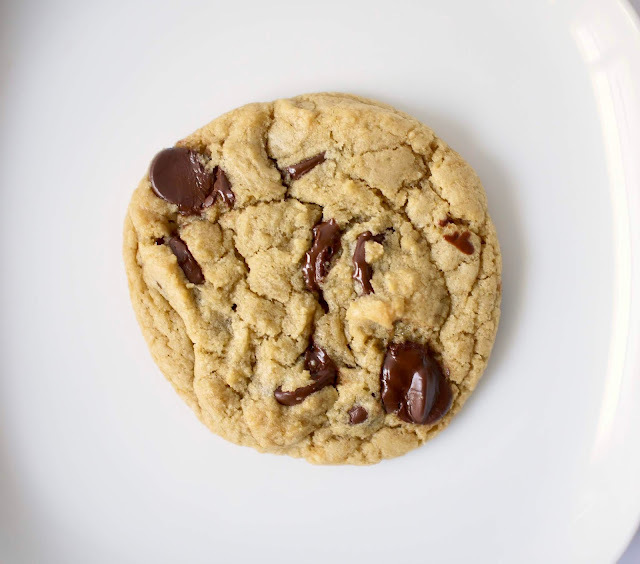 The Jacque Torres cookies used the most expensive chocolate, required two types of dough and also had a rest period of 24-72 hours. In the end, these were good cookies but almost not worth all the fussiness (they were at the bottom of my list at the final tasting). The Cook's Illustrated cookie is a quick cookie to put together when you have a craving for cookies and don't want to wait for butter to soften/brown or wait for dough to rest in the fridge. 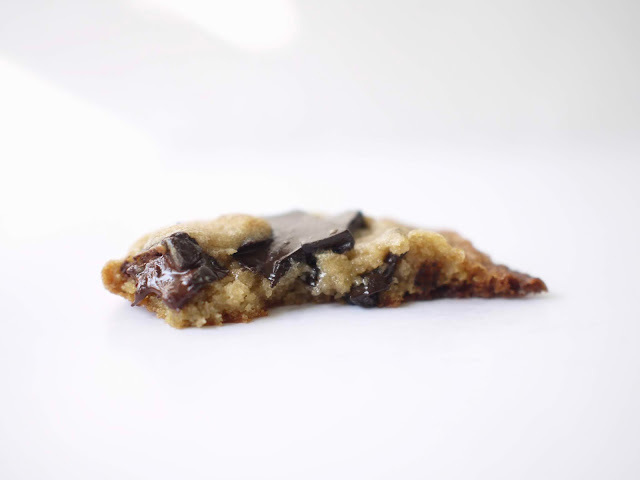 The Serious Eats Food Lab cookie, once it cooled, kept its chewiness the best. Even though they sometimes baked flat, they never got crunchy. The BraveTart cookie fascinated me because right out of the oven, it wasn't an over-the-top amazing cookie. But then after a few hours and even days, the flavor really developed and I couldn't stop eating them. 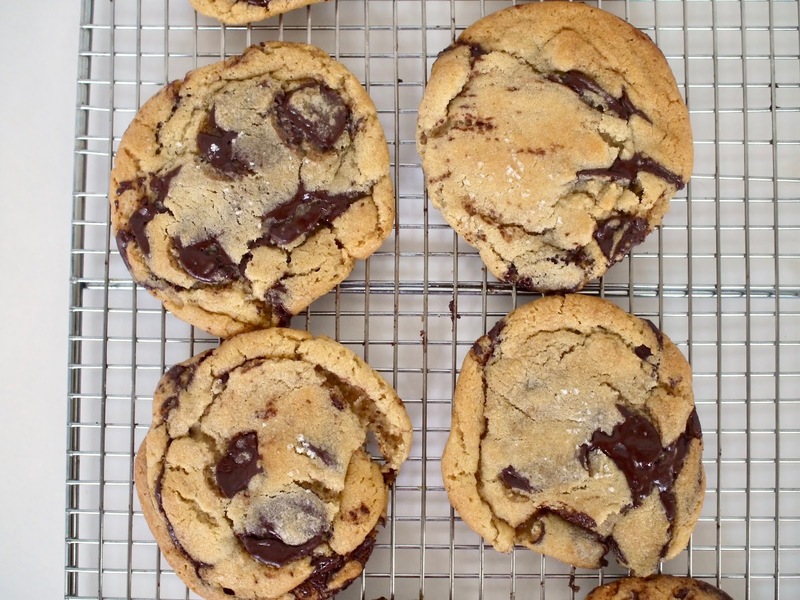 So if you are a rare breed that doesn't gobble up a batch of cookies right after they are baked, these are for you. America's Test Kitchen's cookie beat out all the other tasty cookies in the final tasting--its caramel/nutty flavor really came through that I crave for in a cookie. Happy Belated Fat Tuesday! I kept my tradition of consuming paczki on this holiday yesterday and was even surprised to find a local bakery making them (last year I drove out to the burbs to get my Polish Fat Tuesday doughnut fix). A local Australian bakery, Banksia, located in downtown Kansas City showed up on my google search for paczki in Kansas City. 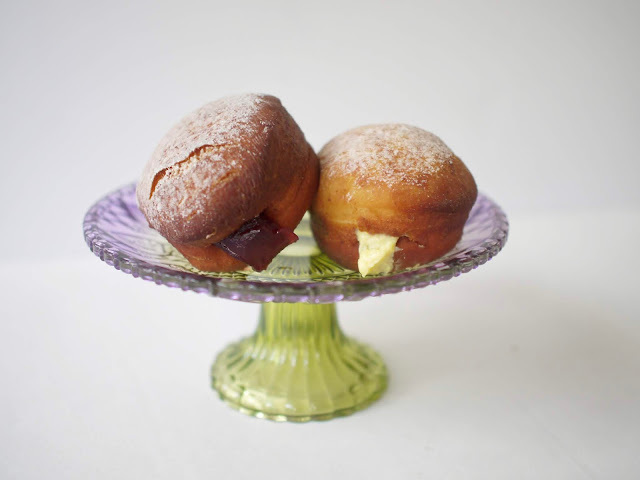 They had raspberry and custard filled options of paczki and I even called ahead to order one of each. These rich doughnuts were deliciously chewy and generously filled with custard/raspberry preserves but they were a little heavy on the oil flavor. Fun fact: this was my first custard filled paczki in my seven years of paczki eating. I've already started scoping out next year's paczki from Scratch Bakery, who distributes their baked goods to local grocery stores, coffee shops and restaurants around Kansas City. 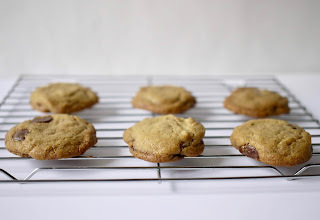 I've decided that after 7 chocolate chip cookie recipe tests, this would be the last one (only because I set a deadline that the Oscars viewing party I threw would be when I would have the ultimate cookie taste testing). 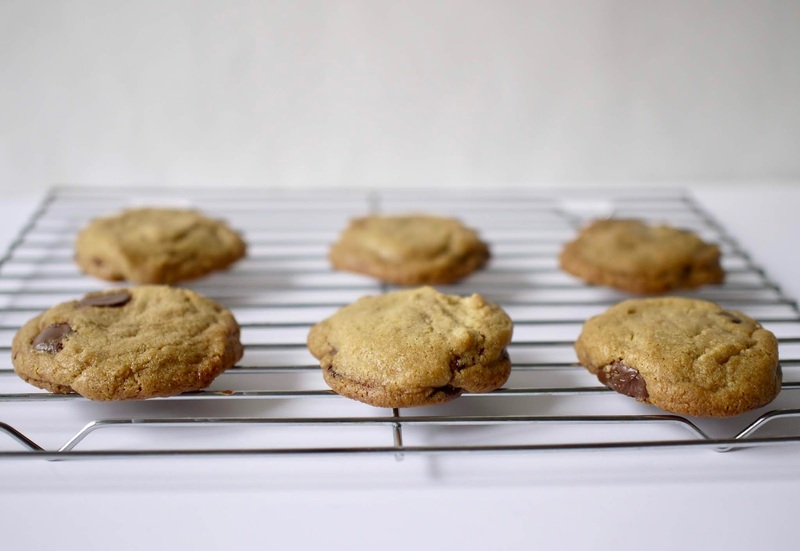 I saved what I hoped would be the best cookie for last: This Serious Eats chocolate cookie recipe has been on my radar for years but I never wanted to go through browning butter and waiting for the dough to rest to finally eat the cookies. Well, now that I've browned butter on several occasions and have waited for dough to rest, these steps don't seem too daunting anymore. 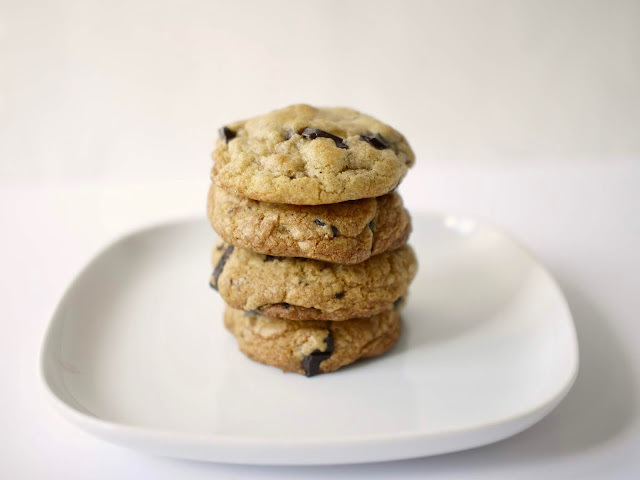 The Recipe: Serious Eats Food Lab's Chocolate Chip Cookies by Kenji Lopez-Alt, who exhaustively baked to find the perfect chewy chocolate chip cookie. 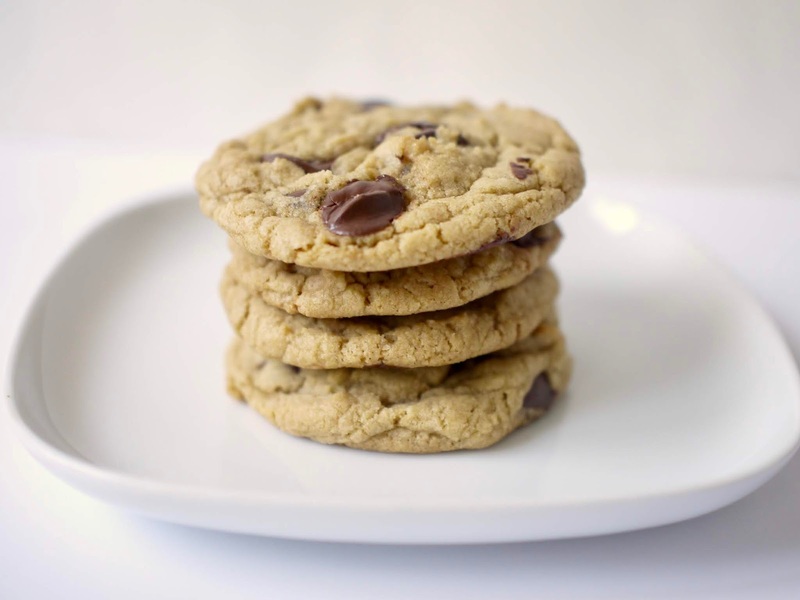 Alton Brown's chewy chocolate chip cookie recipe got a lot of love from The Kitchn this month in their cookie bake-off. 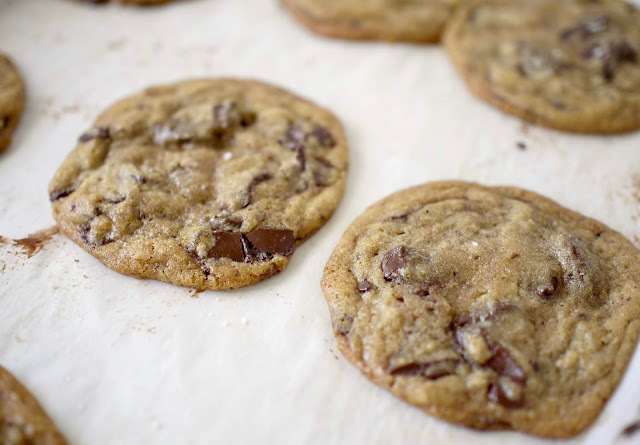 This recipe is more traditional in the sense that it doesn't require an overnight resting period, brown butter, fancy chips or flaky sea salt. 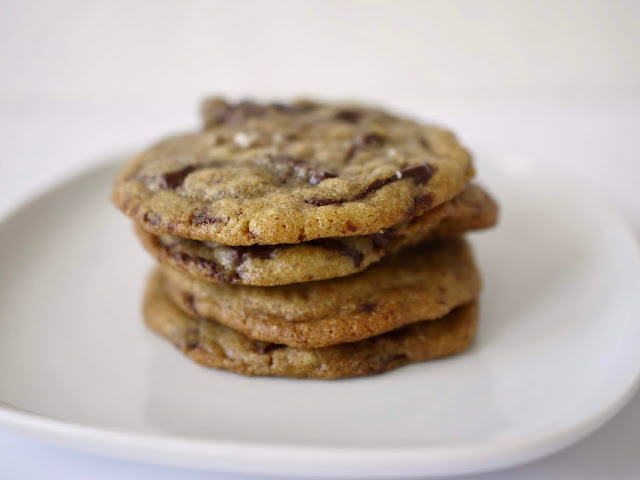 After winning the title "The Very Best Chocolate Chip Cookie," I knew I had to add this recipe into the mix. I used to think America's Test Kitchen and Cook's Illustrated recipes went hand-in-hand. After some googling, I've learned that America's Test Kitchen is the larger brand while Cook's Illustrated is a small subset of ATK. 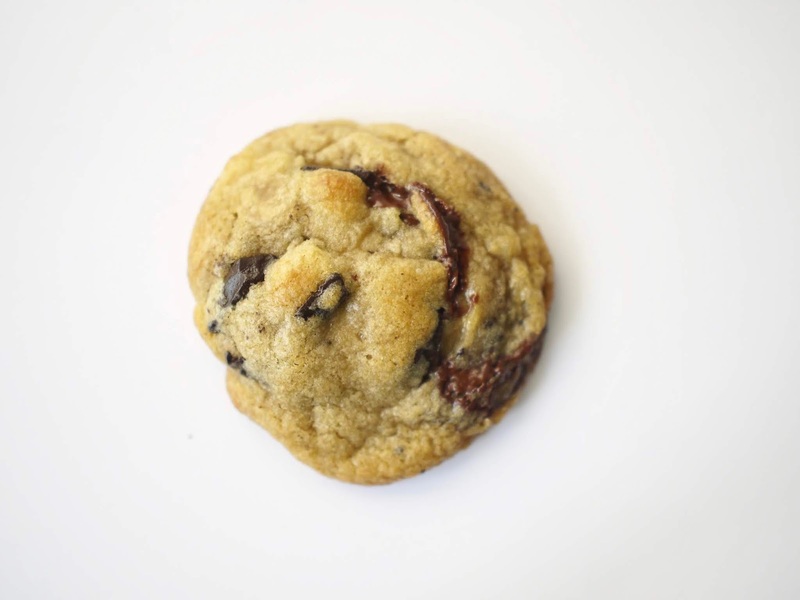 Thinking I made the ultimate, well-tested chocolate chip cookie when I made America's Test Kitchen's recipe, I didn't realize that there was a different but also beloved Cook's Illustrated cookie too. 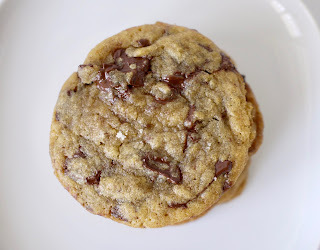 It's my sista Melissa's go-to favorite chocolate chip cookie and since I trust her tastebuds, I decided to include her favorite into my cookie testing. 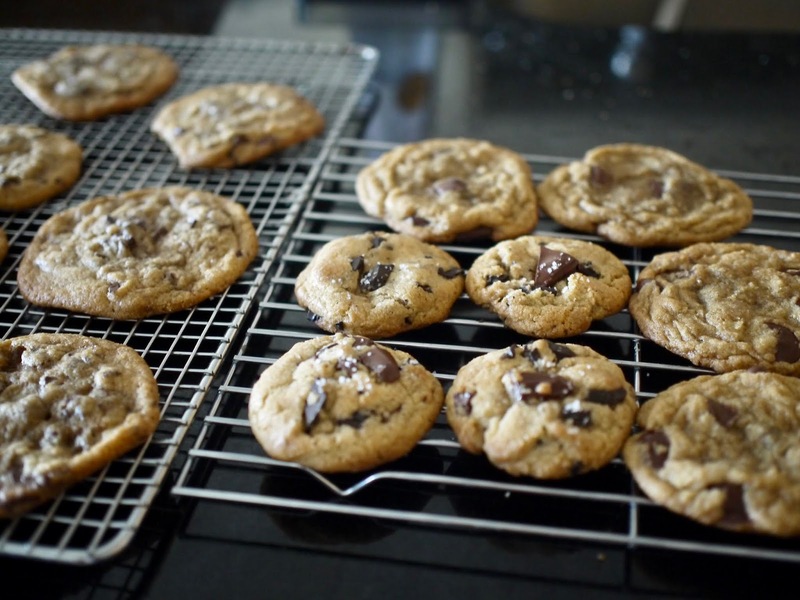 🍪yuck 🍪🍪eh 🍪🍪🍪good 🍪🍪🍪🍪great 🍪🍪🍪🍪🍪amazing!